Instant eApproval on Your Personal Loan! Quick, Simple & Easy to Apply. Disbursal in 2 Hours. 100% Online Process. Choose an amount between ₹50,000 and ₹5,000,000. Your Income should be at least ₹400,000 p.a. Are you concerned about where to apply for an instant loan online? Confused about how to get an instant personal loan? Tired of heavy documentation, want to get an instant loan without documents? It’s time to explore what Finance Buddha Insta Loan can offer to you. In an emergency every second count. And, getting money in a hassle-free manner will be the need of the time. As an applicant, you have to fill the easy online application form and apply for personal loan online. Finance Buddha Insta Loan is an instant loan and offers disbursal within 2 hours. Furthermore, it is one of the fastest online personal loans you can get in India. Our Instant Loan process takes 2 Hours from application to disbursal! We have brought together experts in the banking sector. They have top-notch competence in loan management, and time management skills. Hence we deliver you high-quality services through our online personal loans facility. As such, Finance Buddha can assist all individuals with their instant personal loan application. Due to the high demand for online personal loans, we have extended our services to this stream. This is to make sure we provide more and more opportunity for those who are keen to take loans for any emergencies. Make use of our online personal loan service and get a personal loan online today. How does an Instant Loan work? If you want to avail an instant personal loan, visit the Finance Buddha website. Fill the application form above online and submit. After the form&apos;s submission, the applicant&apos;s details will get scrutinized using our algorithm. Hence, saving both the time and effort. Soon after verification, we will let you know if you are eligible for an instant personal loan. And finally, your online loan application will get processed and disbursed within 2 hours, same day. This makes our Insta Loan the best online loan for those who want an urgent personal loan. Apply for instant personal loan online. Get advice on your best offer. Whatever be your emergency, we are here to help! Few incidents in life leave you with not many options. In a situation like where all your advance preparations might also not be enough. If you are in such a need, Finance Buddha’s Instant Loan will help you overcome in a quick, efficient and hassle-free manner. Our instant loans can be availed for different emergency situations. The money borrowed through an instant loan is available immediately. We do not require any physical documentation for processing this loan. As all need required documents have to be uploaded online. Life is Unpredictable! Nobody ever knows what might happen the next instant, so unsure are we about our lives. Accidents can happen to anyone anytime. Such situations require quick response and immediate treatment and every second count! And you would not want to spare any expenses whether for yourself or your near and dear ones. Nowadays even medical expenses are also soaring high, so much so that sometimes even medical insurance and emergency savings combined cannot cover the total expenses. A personal loan in one day is definitely your savior in such times which minimizes the effects. Finance Buddha understands the urgent need, which arises in medical emergencies. Finance Buddha and its team do its best when such a requirement arises. This is a completely online personal loan process hence you do not need to visit any of our branches or arrange for the hard copy of the documents. You just need to fill in the personal loan application online and upload all the required documents. And that is it. In the cases of emergency, Finance Buddha will always be by your side. You can now avail Finance Buddha’s Instant Loan to meet your urgent travel expenses. Whether it is to a destination in India or abroad, whether it is for a personal reason or a business deal, or any medical requirement, Finance Buddha has got you covered. Just apply for personal loan online. Then upload your required documents. We work hard to ensure that approval is instant and the disbursal happens on the same day, within 2 hours of instant approval (provided that you are eligible). The wedding is one of the most important events, if not the most important event in anybody’s life. As such everybody wants their wedding to be a dream wedding. But the conversion of the dream to reality comes at a price. Sometimes unexpected may happen and leave you in a cash crunch, unable to meet the need of the hour. In many instances, it might not be possible to cut down the expenses. Wedding expenses do not include just the cost of the main wedding function, but also things like pieces of jewelry, clothes, gifts, engagement, reception, and honeymoon. The price for all these is normally much more than what a middle-class income group can afford to spend. Use our same day loans facility, whenever you need immediate cash loans in India. You can apply for personal loan through our website. This is an entirely online loan process. Online loans make sense for weddings as these are very convenient to apply for, especially for weddings, when you are in a shortage of time. You are innocent until proven guilty and sometimes, you might not be guilty at all. And sometimes, it might not be you but someone who is very near and dear to you. But, the police need to follow rules set by our lawmakers, and the bail amounts can be high (depending on the charges) and might not be possible for everyone to have that much money available to them at their disposal. But you can have it in 2 hours with Finance Buddha’s Instant Loans. We understand that emergencies like an arrest can affect you and your family severely. Hence we have made personal loan process 100% online wherein you can apply online anytime from anywhere. As soon as we have everything we need, your loan processing starts and based on your eligibility criteria your personal loan application is approved and disbursed within 2 hours. It never remains sunny throughout the year! All the business owners know and understand this very well. Urgent situations demand speedy solutions. Finance Buddha is here with its Instant Loan to cover you in that rainy season. Our, Instant Loan is a completely online personal loan product where you get instant eApproval and disbursal within next 2 hours, should you satisfy all the eligibility criteria for the same. Thus, the process is quick and hassle-free. Here are some of the features and benefits of instant personal loans from Finance Buddha. Loan Amount starting from ₹50,000 to ₹5,000,000. Not everybody’s need is the same. It varies from individual to individual, depending on the situation they are facing. Hence, we offer a wide range of loan amount. The loan starts from ₹50,000 and goes up to 5,000,000 to have you covered in the times of need. Loan Tenure up to 2 years. An emergency situation can arise anytime. And, the only solution out might be an instant personal loan. But that does not mean that you have to carry the burden of an one-time need for a long period of time. The tenure for Instant Loans is 2 years so that you do not remain overburdened with the loan for a long period of time. Desperate times need desperate measures. Emergencies may not leave enough time to arrange all the paperwork required for a personal loan. Hence we created a completely online personal loan process. Here, you can upload all the documents required from your computer, mobile or tablet. Hence, saving you a lot of time to focus on other important things. Finance Buddha Instant Loan offers instant eApproval and disbursal within 2 hours. Within seconds you will get to know the status of your instant loan status. As the process is online, we will have all the required information with the loan application. Then our proprietary algorithm runs in the background to decide your eligibility. The amount gets credited to the applicant’s account after final approval. The loan amount will get disbursed after you accept the offer letter and sign the loan agreement. Interest rate starts from 10.5%. Our instant loan interest rate is same as that of conventional personal loans. As such, instant loans are online personal loans sans paperwork. An ideal option in case of Emergencies. Our instant loan offers a completely online, quick and hassle-free process. We strive to complete the process in under 2 hours. As, such you get personal loan in one day, the same day you apply for it. This makes the instant loans the preferred option for emergency scenarios where there is an urgent need of money. Available in all major Indian Cities. You can avail Instant Loan in any of the 180 cities in India, such as: Agra, Ahmedabad, Amritsar, Aurangabad, Bangalore, Baroda, Bhubaneswar, Bhopal, Chandigarh, Chennai, Cochin, Coimbatore, Dehradun, New Delhi, Faridabad, Ghaziabad, Gurgaon, Hyderabad, Indore, Jaipur, Jamshedpur, Kanpur, Karnal, Kolhapur, Kolkata, Lucknow, Ludhiana, Madurai, Mumbai, Mohali, Nasik, Nellore, Noida, Pondicherry, Pune, Rohtak, Salem, Satara, Surat, Thane, Tiruchirappalli (Trichy), Vijayawada and Visakhapatnam (Vizag). Eligibility basically means ‘Fit to be chosen’. That implies are you worthy for which you are applying. Instant Loan is an instant personal loan is generally availed in the case of emergencies. Emergencies can be of many types like a medical emergency, traveling emergency, to bear any urgent wedding requirements and many more. In emergencies, people want money urgently so Finance Buddha has come up with Instant Loan. Finance Buddha&apos;s instant loans are an unsecured loan. Hence it becomes more important to check the eligibility of the borrower before the loan disbursal to determine the repayment capability. This is a big point to consider. There are many factors on which your loan eligibility depends. The younger you are more is your probability of getting a loan. When you are young the bank or any financial organization thinks you are more capable of repaying the loan. To avail instant loan the applicant&apos;s age should be between 25 to 65 years. Your income is the most important factor on which your Instant Loan eligibility depends. The more you earn, the more is the possibility of timely repayments. In the case of our instant loan, if you are a salaried person your yearly minimum income should be ₹400,000. And, if you are a self-employed person your minimum income should be ₹600,000. Employment stability is also an important factor on which your Instant Loan eligibility depends. A salaried person should have at least 2 years of full-time work experience in the current profession. And the self-employed individuals should have at least 5 years of earning turnover. Your credit rating holds a lot of value. It reflects your financial borrowing history and your repayments history too. If your credit score is high your probability of getting a loan is more. Generally, a credit score of 750 is considered good. With a CIBIL score of less than 750 the chance to get approved is less. And in some case, you may get the instant loan but then your interest rate will be higher. The employer with whom the borrower is working with is the most ideal approach to gauge the credit-worthiness of the candidate. Being a piece of high turnover organizations is an advantage with regards to applying for the loan. How to be eligible for an instant loan all the time? Our instant loan is the fastest financing solution in urgent times. To avail, the Instant Loan facility one has to be eligible as per the eligibility criteria mentioned above. Failure to meet eligibility criteria will result in rejection of the online personal loan application. To avail an Instant Loan, the applicant should have a minimum CIBIL Score of 750. CIBIL Score is the reflection of your borrowing and repayment history. A good CIBIL Score implies a good mixture of secured and unsecured loans and regular and timely repayments. An applicant with good CIBIL Score stands out as a creditworthy borrower, who will be regular with the repayments. So, be regular with your existing repayments, if you have not been so far, or continue it if have been already. This will help to improve CIBIL Score and will also help in availing any loan in the future, not just our instant loans. To repay any loan in EMIs, one should have a sufficient income that even after paying for the EMI. There should be enough left for other necessities such as rent, food, bills, clothes, and transportation. In general, the ratio of the total monthly EMIs should not exceed 35% of the monthly income. Even in high-income range, fixed monthly obligations should not be in excess of 60% of in-hand monthly income. Whatever be your salary range, if your FOIR is higher, it would be a good idea to either: lower your existing EMIs with a balance transfer loan or find an additional source of income. This will increase the chances of approval of the Instant Loan application in the future if the need be. Salaried Employees of top-notch companies and MNCs have a secure and stable future and hence employment. In contrast, small and medium companies, proprietorship and start-ups do not have a secure future. There is always a risk involved. These start-ups can shut-down anytime, jeopardizing their employees financial future. Any lender will always prefer an employee of an MNC over an employee employed with a start-up. Also, the employees of top companies get additional relaxation in the rack interest rates of any loan. Another important factor considered is job stability. It becomes for any lender to gauge an applicant’s eligibility if they have a stable and continuous career. This helps the lender to analyze the financial condition of the applicant and their repayment capability. While an applicant with multiple job changes and employment gaps cannot be trusted with any loan, as their income is neither stable nor guaranteed. In such a condition it is tough to decide whether such applicants would be regular with their repayments or not. Hence a natural inclination of any lender would be to decline the application from such applicants. Finance Buddha Instant Loan is an instant loan without documents. This means that no physical documents are required at all. And instead, digital versions of all the required documents are to be uploaded through the mobile app. Along with meeting the eligibility criteria, you will still require to submit some documents so that we can confirm your identity along with other criteria. This is compulsory, and the below documents should be furnished upon request. The tenure of an instant loan is up to 2 years. The interest rate is a profit a lender charges against their lending annually. Normally if the borrower is at low risk i.e. the lender finds it that they can easily repay the loan, then the interest rate is low. And if the lender finds that the borrower it at high risk then they charge a high-interest rate to them. There are many factors which decide the interest rate of instant loans. Suppose a person has a yearly income of ₹400,000 & applies for a loan of ₹600,000 and a tenor period of 2 years. Then for the lender, it is a risky case as in this case there is more possibility of default. To be on the safe side the lender will charge more interest rate. So for the interest rate, the loan amount and individual income play a very important role. Tenure period is also one of the important factors which play an important role in determining the interest rate. If the tenure is shorter, higher will be the interest rate and vice-versa. Each and every lender or financial institution checks your credit score when you apply for a loan. The credit score always reflects your present as well as past financial borrowing history and your repayments as well. A low credit score means that monthly repayments regarding any of the previous loans were not on time. Whereas, a good credit score of 750+ indicates that the borrower is good and has been timely with the repayments. Every borrower has to pay the processing fees. Processing fees are a charge that passes on expenses to the borrowers. The expenses include documentation, evaluations, work, and record of loan repayment, or some other data essential for the lender&apos;s endorsing office. This is a non-refundable. The processing charge for Instant Loan is 1.50% to 2.00% of the loan amount in addition to service taxes. In the case of Instant loan Finance Buddha also provides part payment and part prepayment options. But terms and conditions apply. This charge depends on many factors such as the principal loan amount, the outstanding amount, monthly EMIs and so on. There is always a penalty charge for the delay in payments. Instant Loan has some penalty charges for delay in payment this depends on the outstanding loan amount with us. This late payment doesn’t lead to penalty only but it leads to a bad credit score as well. This can affect you in the future when you will apply for some other loan. To avoid these charges and difficulties you should also pay EMIs regarding any kind of loan on time. Tenure is also considered for instant loan&apos;s interest rates. Let us understand this with an Example: You take a personal loan of ₹300,000, for a tenure of 3 years, offered at an interest rate of 10.5% on a reducing principal and you are charged a processing fee of 2.5% which you can give directly at the time of loan processing or that it will be deducted from your loan amount when sanctioned. Total Interest paid in 3 years = ₹51,036, hence, annual interest paid = ₹17,012. CIBIL Score and Repayment History: Instant Loan requires that the applicant should have a CIBIL score of more than 750. CIBIL Score denotes a person’s credit usage and repayment history. The better a person has utilized their loan and credit card facilities, i.e. have not remained overburdened with multiple loans, did not have a history of revolving credit and a record of timely repayments without defaulting on any payments will have a high CIBIL Score, in comparison to a person who has failed to achieve this. A good CIBIL Score (750+) denotes that an applicant is credit-worthy and if allotted the loan, will be timely with the repayments. Hence before you apply for an instant personal loan, it would be a good idea to be aware of your CIBIL Score. There are chances based on the discretion of the lender that even an applicant with low CIBIL Score can also get loans online, but they would get it at the higher interest rates. Interest Rate: Even though the interest rate offered will depend on multiple criteria, it has a direct impact on the EMIs. The higher the interest rate, the higher would be monthly instalments. High monthly instalments can leave you short of the money required every month for the necessities, hence disrupting your budget. If you feel that the offered interest rate and the EMI is higher than that you can afford, it will be better to look for an alternate option. Hence be sure of the interest rate and the EMI before you sign the loan agreement so that your budget does not get affected negatively. The Need for It: Finance Buddha’s Instant Loan is offered at an interest rate higher than the conventional personal loans. Hence the reason for availing the personal loan should be justified. If it is an urgent need, and immediate cash is required, then it makes complete sense to avail Instant Loan. But, opting for an Instant Loan for a shopping spree, a costly gadget or vacation abroad, makes no sense. Online loans are very helpful in times of need but can be a big burden if availed for unjustified reasons. Fees & Charges: All loans include a processing fee which gets deducted from the total loan amount before disbursal hence lowering the amount you actually receive. Apart from processing fees, there are charges of late payments and prepayments. Hence it will be wiser to know these in advance rather than discovering them after the loan has been disbursed. Here are a few tips to make your Instant Loan application hassle free and increase your chances of getting approved the first time itself. All financial transactions like online loans have a few terms and conditions to which the consumer is obligated should they choose to avail them. These terms and conditions are there to ensure the full repayment of the loan amount and charges that apply to different situations and requirements. In general, the before the e-signing of the loan agreement, the customer is made aware of the rules, terms, conditions, and charges, but still, it is the responsibility of the borrower to be aware of every detail before they choose to sign the agreement. This saves them from future shocks and surprises and also makes them aware of their responsibility as a borrower. Finance Buddha provides everyone to choose an instant personal loan amount between ₹50,000 and ₹5,000,000. But this does not imply that everyone should be choosing the maximum loan amount option available. The choice of personal loan amount should be based on first and foremost your exact requirement. Secondly, on your repayment capability and finally your eligibility. Being greedy might result in, excess loan burden than required, a disturbed budget and loan rejection (which has a negative impact on your CIBIL Score). You should always make use of a Personal Loan Eligibility Calculator and Personal Loan EMI Calculator to know in advance, the maximum loan amount you are eligible for and should that loan amount get approved, what will be your EMIs and the charges involved. This will make clear in advance what would be the EMI that you would be paying every month thereon and will help in planning the budget accordingly. Keeping your documents ready even before starting the online personal loan application will save you the last minute hassle of arranging documents while applying. Documents like photographs, bank statement, and address and identification proof can all be saved as PDFs and images on devices like computers, smartphones, and tablets. Having these ready in advance, you can upload them when prompted. This will ensure a break free process of online personal loan application. Providing the correct and authentic information as requested for online personal application will ensure that you will get the best offer available for you and will also decrease the chances of your application getting rejected. Any lender goes to multiple extents to verify and cross verify each piece of information provided by each applicant before approving or disapproving the loan application. Your loan application will get rejected even if single fake or misleading information is provided. Hence it is in the best interest of both the applicant and the lender, that the applicant provides online correct, genuine and authentic information. The credit report is the first checklist of the lender prior to sanctioning any kind of loan. The credit information companies keep a track of all the credit-related behaviour of any person and based on the same a credit report has been prepared. So, check the credit report before reaching the lender and if there are any flaws make sure that you correct them before reaching the lender. Along with the credit history, the credit score is also an important criterion to be checked. Your credit score will be considered as excellent if it is more than 750. If the credit score is less than 750, your loan application may get rejected. So before applying for a loan, it is highly recommended to check the credit score. Multiple loan application can create a negative impression of yours. When you apply for a loan with multiple lenders without much gap, it shows your credit hungry behaviour which is a negative remark for the borrower. So keep yourself away from such activities to get easy approval on your loan application. The FOIR (Fixed-Obligation-to-Income ratio) is used to find the repayment capacity of the lender. If the total payable of a person including the applied loan is more than 50% of his net monthly income, the lender assumes that the person may default the loan in coming days. So, try to keep your FOIR low before you apply for the loan. Check Eligibility: To find the best personal loan offer, one should know first about their eligibility. The interest rate and terms and condition may differ from lender to lender. One must research on lenders available in order to find the best loan offer. Check Credit Score: Credit score is one of the eligibility criterions of personal loan eligibility. One should check the credit score prior to applying for a personal loan to get an assured approval on the loan application. Opt for Shorter Tenure: Though longer tenure keeps the loan burden low, it drains much money in interest component. Hence keeping the loan tenure shorter makes the loan a less expensive one. Borrow More Than You Can Afford: While borrowing, be assured that you can easily pay off the loan. If you borrow more than your repayment capacity, you may face difficulties in days to come. Borrow Money for Investment: A personal loan is a multipurpose loan, hence can be used for any of the uses. But one should never borrow money to invest or gamble. As those things carry high risk so taking a risk on borrowed money is never justified. Miss or Delay EMIs: The repayment of personal loan happens in EMIs. If you are under a loan, make sure that your loan EMI is running at a smooth manner. Defaulting in EMIs not only make you pay a penalty for the same, but it will also adversely impact your credit score. The year 2017 witnessed many changes in many fields and Paperless loan is such one among other changes. The paperless loan is the change which was need of the time. Ever since the start of banking, the process of availing a personal loan has been a lengthy process followed with lots of stress, tension and time consumption too. Because of all these reasons, it was very important to introduce a new kind of lending instrument which would be easier for the people to avail. An Instant Loan is a solution to all the above problems and a new age in the domain of lending. Paperless Personal Loans are nothing but a personal loan only where you can get your loan within a very short duration of time, without having to deal with any paperwork as the process is 100% online from start to finish. With paperless personal loans you don’t have to spend hours going bank, standing in the bank’s queue. This loan makes you free from the traditional lending process where you have to spend your time in collecting and piling up the documents required. A paperless loan is a completely online process where your loan is just a click away. You don’t have to submit any document physically. All you need to do is to just fill the details required. Only a few documents such as documents for ID and address proof are required which is to be submitted online by scanning and uploading them online. The ease and flexibility in the application method have made paperless personal loans a popular debt instrument among the masses. Day by day the lifestyle of people is increasingly getting urban and digitized. Everybody wants to purchase new equipment, gadgets and wants to go on holiday and many more things. All these come at a cost and sometime the money in hand might not be just enough, and personal loans are a better option compared to a credit card. Today in this busy world, everyone is so occupied and busy in their routine life and hence want more ease in each and everything is it shopping, networking or even banking. And same is the case of banking with the introduction of paperless personal loans. Paperless loans provide flexibility and comfort in the borrowing process. People who are already occupied with one or the other thing can now apply for personal loans as per their comfort. Paperless personal loans just like conventional personal loans are unsecured loans where no collateral or security is required. The loan amount can be used for any personal purpose as per the need and wish of the borrower. It’s fast processing and quick disbursal is another reason for which makes it a go-to product when the money is required immediately. How do Quick Loans work? A quick loan which is also called instant loan is nothing but a personal loan which is processed entirely online. The processing is done with pre-set computer programmes which make the loan processing faster than one can imagine. A quick loan is very popular among young professionals because of the quick processing and fast approval. Despite being costlier than a secured loan, personal loans online are still ruling the credit market just because of the appreciable services provided by FinTech lenders. The lenders have made the loan processing so very simple that, any needy who is eligible for a loan can get the desired amount in his bank account instantly. The pulling force because of which the lenders can make the processing fast is the internet. Lenders nowadays do the entire loan processing online which saves a lot of time and effort of both the lender and the borrower. If you are eligible for the loan and have submitted the documents properly, it takes just a few minutes to get an e-approval on your loan. Unsecured Loans – What should borrowers know? Unsecured loans are the loans which are not backed by any of the valuables of the loan seekers. An unsecured loan is granted to a borrower based on credit history and the loan repayment capacity. Most of the unsecured loans are multipurpose too. A multipurpose loan can be used for any kind of need of the loan seeker. A personal loan is an example of an unsecured loan. The eligibility of an unsecured loan depends on several criteria. Prior to granting a loan, lenders do check the income, other financial liabilities, past credit behaviour, credit score, etc. The interest rate of an unsecured loan is slightly higher than secured loans as the risk of NPA is high in case of unsecured personal loans. In online loans, no physical documentation is required whereas in general personal loan physical documentations are required at many stages. Processing and loan disbursal is very fast in online loans which generally takes from 24 to 48 hours, but in the case of a personal loan the processing takes much more time than the online loans and can be between 3 to 5 days depends on the financial institution with which you have applied. Online loans are the best option in case of emergency situations like a medical emergency, travel emergency or any kind of financial emergency. When you are in an emergency then time matters for you a lot and for that online personal loan is best as it is having quick disbursal. Whereas the personal loan from a bank/NBFC can be availed for any personal requirement but for emergencies, we can’t rely on the disbursal speed of the loan. Online loans are being offered by only a few organisations like Finance Buddha and few banks and NBFCs in India. In the case of Finance Buddha for an online loan, the loan amount can be from ₹50,000 to ₹5,000,000. And in case of other online personal loans against a credit card, your loan amount depends on your credit card limit. Whereas in case of personal loan you are having many options i.e. many banks to go with. And in that case, your loan amount depends on the bank with which you have applied. As regards the interest rates and tenure period, for online loans the rates are somewhat higher than a general personal loan as the tenure period is less as compared to that of the personal loan. In online loans, you don&apos;t have to visit any place even for a single time. All you need to do is visit the website, from a place of your comfort at your choice of time and with just a few clicks you can apply for loans online. In the event of you providing all the required details correctly and you satisfying the required eligibility criteria, you will have the loan amount disbursed to your account within 2 hours of approval, which by the way also happens online. Pre-approved personal loans are only for the existing customers of any lending institution. Whereas for availing FinBud Instant loan no particular bank account is required. The only thing required is you should fulfil the eligibility criteria. Pre-approved personal loans require zero documentation as the lending institution already has all the details of the customer, whereas for the Finance Buddha Instant loan there is paperless documentation facility available where one needs to upload the scanned copies of all the required documents. Pre-approved personal loans have a pre-determined upper loan amount, which can be less than your requirements whereas in FinBud Instant loan there is no such restriction, you can have a loan from ₹50,000 with the upper limit being decided based on your creditworthiness. One does not needs to provide any physical documents when applying online. Just upload the scanned or digital copies of all the required documents and upload them through the mobile app. Applying for a loan online makes the process much faster. Online loan applications are processed through algorithms. Hence, it takes much less time as compared to manual processing. Applying is very easy as you never need to visit the lender&apos;s office. You can apply for a loan while being in your office or relaxing at home. An online loan gives the convenience of tracking the application. As soon as you apply for a loan, the lender will provide you with a login ID. You can log into your loan account and check the progress of the application at any time. We provide you a 24X7 service. Unlike a traditional loan application where you must abide by the timings of the bank’s functioning hours, an online loan can be applied any time and any day, even on bank holidays. Why apply for an Instant Loan through Finance Buddha? While there are many ways to apply for a loan, many still prefer to apply for personal loan online through Finance Buddha, the reason for this is pretty simple and straight forward. In case of emergencies situations, nobody will have time to run to banks and financial institutions to get the application form, apply for the same, submit documents and wait for approval. All the services will be taken over by Finance Buddha. Just visit Finance Buddha platform, apply for the instant loan by filling all necessary information and get instant approval and disbursal within the same day. Finance Buddha’s Instant Loans are essentially 100% online loans, where all the steps involved are done online both on the applicant’s side and the lender’s side. The applicant has to just apply online, upload the documents as well as the eSign the loan agreement. The application is processed as soon as it is received. Finance Buddha’s proprietary algorithm works in the background to determine the eligibility of the applicant and find the best offer available if eligible, post which the application gets approved. The removal of the human element from the approval process significantly improves the time involved, reducing it to a maximum of 2 hours. We use our proprietary algorithm to scrutinize all the received documents to verify their authenticity. As soon as the processing is over, the applicant receives the confirmation and the disbursal of loan amount soon after. Taking the loan process completely online has not only reduced the time but has made the application process more streamlined, easy and completely hassle-free. There is no need for any physical visits or documents as the process is completely online throughout. As a result of the availability of online loans to more and more people. Finance Buddha’s online loans provide the comfort and freedom to apply from a place of their comfort at a time of their choice. The availability of loans (to eligible applicants) within 2 hours of applying makes instant loans ideal for those who are in urgent need of money. This loan is also ideal for those who don&apos;t have time and means to go through a conventional personal loan process. Hence, don&apos;t wait and apply for personal loan online today. What is Finance Buddha Instant Loan? Instant Loan is a quick personal loan offerring from Finance Buddha. It is a completely online personal loan process. And, one can apply without documents for it through our website. It offers the benefit of disbursal in 2 Hours. Are my personal and financial information safe with Finance Buddha? Are pre-payment and part-payment facilities available for Instant Loan? Yes, prepayments and part-payments are available for Instant Loan, but under there are terms and conditions. Are there any late fees for the instant loan? Yes, a late fee is charged for the Instant Loan which will depend upon your Loan amount and Interest rate and so on. Can I get an instant personal loan with a credit score of 550? Generally, for getting approved for an instant personal loan you need a credit score of 700+. However, you can also qualify for an instant loan with a credit score of 550, but for this, you need to have good income and good repayment capacity. The interest rate charged in this case may be a bit higher than the normal case with a good credit score. Can you apply for a instant personal loan online? Yes! You can apply for a personal loan online. The only thing you need to do this is- go online and search for Finance Buddha, you will get the result. Open the website and apply for an Instant Personal Loan. Does my instant loan eligibility depend on my CIBIL score? Yes, your Instant Loan eligibility also depends on your CIBIL score. For the approval of your Instant Loan, your CIBIL score should be at least 750. But your final eligibility will depend on other factors too such as your income, your age, and your current location also matter. How can I get a personal loan fast? Generally, disbursal of a personal loan takes 4 to 5 days with most of the lenders. But to get a personal loan fast you need to apply for an online personal loan or an instant personal loan. How do I contact Finance Buddha? How do I track my loan application status? You can also download Finance Buddha Android App to see these details and apply for personal loan online. How is EMI calculated for Instant Loan? The full form of EMI is Equated Monthly Instalments. It is basically the money which is paid monthly to the banks to repay our Loan amount. Its calculation depends on various factors such as the Loan amount (principle), the tenor period, and the interest rates. Where p is the principal amount, R is the rate of interest and n is the number of monthly instalments. How long does an instant loan process take for disbursal? The time taken by us to disburse a quick loan is 2 hours. But the loan disbursal is not only in the hands of the lender. Many a time, a lender is forced to delay the disbursal because of the issues at loan applicant&apos;s end. Let&apos;s say the loan applicant submitted the application without completely filling the form or if there are any flaws in the documents submitted, the disbursal time may get extended. If all the data provided by the loan seeker is genuine, it takes just 2 hours to get the loan disbursed. How long does it take for instant loan to be disbursed in my account? It takes only 2 hours for instant loan to be disbursed in your account after the loan application has been processed. What else can be better than to get the personal loan disbursed the same day if you are in urgent need of cash? In which cities Instant Loan facility by Finance Buddha available? Agra, Ahmedabad, Amritsar, Aurangabad, Bangalore, Baroda, Bhubaneswar, Bhopal, Chandigarh, Chennai, Cochin, Coimbatore, Dehradun, New Delhi, Faridabad, Ghaziabad, Gurgaon, Hyderabad, Indore, Jaipur, Jamshedpur, Kanpur, Karnal, Kolhapur, Kolkata, Lucknow, Ludhiana, Madurai, Mumbai, Mohali, Nasik, Nellore, Noida, Pondicherry, Pune, Rohtak, Salem, Satara, Surat, Thane, Tiruchirappalli (Trichy), Vijayawada and Visakhapatnam (Vizag). If you are in one of these cities and are in urgent need of cash, then make use of the Instant Loan - the online personal loan facility from Finance Buddha to get personal loan online today. Is it safe to borrow personal loan online from Finance Buddha? Yes, it is definitely safe to borrow from Finance Buddha. All your documents are kept confidential. It is a completely safe and easy process. The transaction is completely private, and all the transactions happen over an encrypted connection so that all the information provided by you remains safe. Is my loan reported to credit authorities? Yes, your loan is reported to all the top most leading authorities of INDIA like CIBIL, Equifax and Experian. Under what conditions can I be denied an instant loan? Age Criteria: If you are a salaried employee and your age is not between 21 to 60 days or you are self-employed and age is not between 25 & 65 then your Instant Loan application can be denied. Employment Stability: If you are a salaried person and your work experience in the current profession is not more than 2 years, or if you a self-employed and your total tenure of earning is less than 5 years then also your Instant Loan application will be denied. Credit Score: Your credit rating holds a lot of value. It reflects your financial borrowing history and their repayments. So if you are having a bad credit history then you will be denied for Instant Loan. Monthly Income: If your monthly income is less than ₹50,000 then also you will be denied Instant Loan. What are the same day loans? The same day loans are the personal loans which are disbursed as quickly as one day. The same day loan processing is done online, hence a lot of time and effort can be saved. One can apply for the same day loan from FinTech lenders who are well known for being fast in loan disbursal. Every step of the same day loan is done online. Right from the loan application to loan disbursal, you can do everything regarding the online. Even the documents required and the signature on the loan documents are also done online which make it possible to get the loan amount in the account of the borrower on the same day of applying for the loan. What are the advantages of applying for loans online through Finance Buddha? No physical documentation is required. It is the best option in case of an emergency. Normal interest rates are provided. Hassle free and smooth processing. You don’t have to visit any bank or even any of our offices. It can be availed in case of any emergency requirement like medical, vacation, wedding and so on. You can apply for Instant Loan from a place of your comfort at a time of your choice, be it through a personal computer or a mobile device like a smartphone or tablet. What are the documents required for Instant Loan? Latest Electricity Bill/ Latest Telephone Bill/ Latest Credit Card Bill. Employers letter certifying current mailing address. Passport (Valid) - provided the passport address is present address mentioned in application form. Government I-card with a photo. What are the eligibility criteria for Instant Loan? For a salaried person, your yearly income should be minimum ₹400,000. For self-employed your yearly income should be minimum ₹600,000. For a salaried individual the age should be 25-60 years. For self-employed the age should be 25-60 years. For a salaried person a full-time job with at least 2 years of work experience. What are the fees and charges associated with Finance Buddha Instant Loan? What are the interest rates for Finance Buddha Instant Loan? The interest rate for Finance Buddha Instant Loan varies from 10.5% to 24% per annum. What are the minimum and maximum tenor for Instant Loan? The minimum and maximum tenors for Instant Loan are 12 months and 24 months respectively. What are the purposes for which I can avail an Instant Loan? What happens after I apply for an instant loan online? 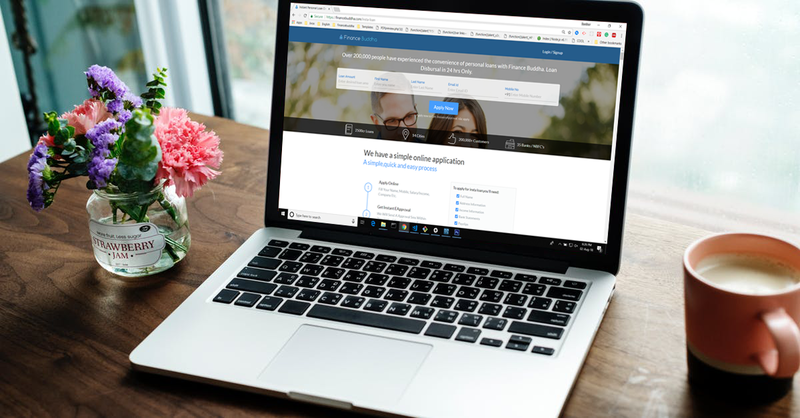 Once you apply for Instant Loan online, our proprietary algorithm will use the details provided by you to determine your eligibility for the requested amount and instantaneously let you know. If you satisfy all the eligibility criteria, you will be sent a link to continue your application process by providing your details and uploading the documents required. Once we receive the details from you, our dedicated team will go through your details and verify all the information provided. Once all this has been done, you will receive a confirmation about your loan details and your loan will be disbursed within 2 hours. What is Annualised Percentage Rate (APR)? APR stands for annual percentage rate which refers to the fixed interest rate for the whole year. Not only for a month. That means according to APR your annual interest rate will be fixed which cannot be varied in any of the months. The APR for Finance Buddha Instant Loan varies from 10.5% to 24%. What is the Instant Loan facility from Finance Buddha? Instant Loan is the facility provided by Finance Buddha in which you can have the loan disbursal on the same very day you apply for it. It is the quickest disbursed loan ever. It is completely paperless and the whole process is completed online, hence making it 100% essentially online loans. Make use of this online service and get personal loan online today. What is the minimum and maximum amount that I can get through Instant Loan? What makes online loans handy? An Instant loan is popular among the borrowers as it is one of the simplest ways to the needed fund. There is a bundle of features which has made an Instant loan handy. The online application feature enables you to apply for a loan on the go. You can apply for a loan while being in office, relaxing on your sofa, while in travel or from outstations too. The flexibility makes this product popular among busy professionals. The Instant loan takes just a few hours to get disbursed. If all the data you have provided to the lender is correct, it takes just 2 hours to get the loan amount in your bank account. The fast disbursal has made an Instant loan best tool to fight financial emergencies. One just needs to submit the basic documents like address proof, ID proof, and income proof to get the loan sanction. Moreover, you can share the soft copies of the needful documents which makes the loan processing much faster and smoother. What will happen if I miss my Instant Loan repayment? The company will impose certain ECS bounce charges or penalties. Moreover, it will get mentioned in your credit report. Contingent upon the seriousness of the default it can have a genuine effect on your future credit potential outcomes like a home advance, personal loan and so on. What&apos;s more, the banks can likewise make a lawful move against the borrower. Legal actions can also be taken against the borrower by the company. When can I borrow again through Finance Buddha? You can borrow anytime again, provided that you still satisfy all the required eligibility criteria for what you have applied. When is online personal loan required? A personal loan is a multipurpose loan, so it can be a great fit for any kind of uses. Whether it may be a financial emergency or a need of fund to live your dreams, you can knock the door of a personal loan lender at any situation. When should I apply for an online loan? An online loan can be your financing partner at any kind of situation. But it can become a life saviour during emergencies like a medical emergency or urgent travel. In an ideal world, we should do things according to our plans. But sometimes we fail to plan, or some other times unexpected situations hit us and leave with financial emergencies. In such situations, a personal loan helps you to come out of those tough times. Other than emergencies, there are many situations when you can get a financial boosting from personal loans. You can apply for a personal loan online to renovate your home, paying down payment of your car, taking a vacation and so on. Who can apply for personal loan online? Ideally, a personal loan can be applied by anyone who is more than 21 years old. But the age is not the only eligibility to apply for a personal loan. The applicant must have a regular source of income. You must have a minimum of 2 years of work experience. In the case of self-employed, your business must have 5 years of existence. Why borrow from Finance Buddha rather than a bank? Finance Buddha has proper loan management and time management skills. We will provide you high-quality service with all our skill and teamwork. The best part about borrowing from Finance Buddha is that you don’t have to visit any bank or even our office, even a single time. You have to just apply online from the Finance Buddha portal for the personal loan. The second best part is that the documentation is completely online. Thirdly and most importantly, the loan approval process gets completed within 2 hours of applying, thanks to our proprietary algorithm. The entire Instant Loan process being online is very seamless, simple and quick without any hassles. Give a try to our Instant Loan facility and get personal loan online today. The loan amount was for Rs 5.25 lakhs which got sanctioned in just 2 days at a nominal interest rate for a tenure period of 3 years. I am paying a monthly EMI of 14,000 per month. I am impressed with the service. They listen to your problems very patently and solves your query in an efficient way. I have my instant personal loan from here. The process was smooth and I got the loan money in just 2 working days. The interest rate charged for my loan is nominal as compared to other personal loans which are offered online. I got a quick response from the Finance Buddha team when I applied for the Insta Loan from there. The process was completed online and the documents were uploaded on the website itself as per the guidance. I get personal loan online on the same day itself. I applied for it through Finance Buddha. I did this with my friend's suggestion. Everything was smooth and my loan was approved on the same day. My decision for going with Finance Buddhas Insta Loan was good and I am happy with it. Rates and charges were nominal. The interest rate at which my Loan was approved is 16.50% and 2% was the processing fees. It is a time-saving product, which you can trust upon in an emergence. Online loans are the new products in the banking industry and Insta loan by finance buddha is one among such loans. I applied for it last month, the process regarding this loan was completed in a hassle-free and smooth manner. This is a great product and I will recommend it to others also. I searched for instant loans on Google as I was in an immediate need of money. I found Insta Loan by Finance Buddha good and I applied for it. The eligibility criteria was minimal and rates and charges were also nominal. In the case of My loan interest rate charged is 16% p.a. Insta Loan is a great product by Finance Buddha. Their executives are very helpful and polite, they guided me throughout my insta loan process. I found the work very efficiently and fast. The process ended in a few hours with my loan approval and disbursal. I applied for this loan after hearing from one of my friends when I was in urgent need of money. I went to the website and applied for it online. My loan was sanctioned in just 3 days. at an interest rate of 13% per annum.